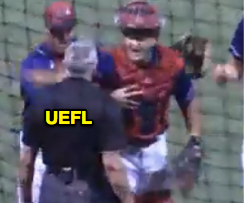 Saturday's Adelaide-Melbourne game in the Australian Baseball League produced four ejections of Bite and Aces personnel as HP Umpire Stewart Howe ejected Adelaide RF Michael Gettys and Pitching Coach Luke Prokopec in the 5th inning (both balls/strikes); Bite Manager Chris Adamson (HBP no-call) and Aces catcher Jake Romanski (Unsportsmanlike/NEC toward opposing dugout) in the 7th—all on separate incidents. With one out and one on (R2) in the top of the 5th, Gettys took a 2-1 pitch from Aces pitcher Dushan Ruzic for a called second strike before subsequently flying out on a subsequent pitch; Gettys was ejected after returning from first base following the fly-out. Replays indicate the pitch was located near the outer edge of home plate (QOCU). At the time of Gettys' ejection, Adelaide was leading, 3-1. With two out in the bottom of the 5th, Prokopec was ejected during a mound visit with pitcher Michael Gahan following a single by Aces batter Allan de San Miguel. At the time of Prokopec's ejection, Adelaide was leading, 3-1. With none out and none on in the top of the 7th, Bite batter Stefan Welch took a 0-0 pitch from Aces pitcher Harrison Cooney for a called ball, having initially shown bunt. 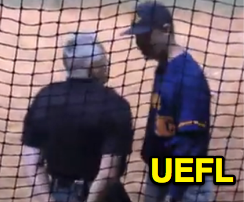 Replays indicate batter Welch did not attempt to strike the pitch, but do not conclusively indicate whether the batter was struck by the pitch; Manager Adamson was ejected arguing for a HBP call. At the time of Adamson's ejection, the game was tied, 4-4. With one out and one on (R2), Bite batter Landon Hernandez hit a fly ball to Aces right fielder Garrison Schwartz, who caught the batted ball and threw to third base as Bite baserunner R2 Curtis Mead attempted to tag-up and advance from second, Schwartz's throw bouncing out of play and awarding Mead home plate. 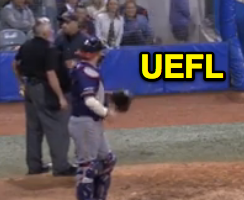 During the ensuing dead ball, Aces catcher Romanski became engaged with the Bite's third base dugout, after which Romanski was ejected. At the time of Romanski's ejection, Adelaide was leading, 5-4. Melbourne ultimately won the contest, 6-5. Alternate Link (EJ-1): Gettys is ejected following his air out in the 5th inning (ABLTV, 1:32:17). Alternate Link (EJ-2): Howe ejects Prokopec after breaking up mound visit in 5th (ABLTV, 1:45:24). Alternate Link (EJ-3): Adamson is tossed when crew consultation doesn't go his way (ABLTV, 2:31:29). Alternate Link (EJ-4): Romanski yells into opposing dugout and gets ejected (ABLTV, 2:35:04).